During his final year of schooling he was offered a position with the University of London at Charing Cross and Westminster Medical School. The pioneering school helped him achieve a position as the youngest group board member of the Royal Photographic Society. During his five years with the school he won several international awards. The faculty also provided him an outlet to hone his computer skills. In 2007, after over 20 years of shooting film he switched to a digital system. He still believes in making every frame count and combines old school techniques with the digital world. Besides shooting in well known locations such as London or Paris he has pursued his photography and assisted fellow photographers in more unique areas such as the Masai Mara , Brazil, Peru, Bolivia and most recently Egypt. These travels also allowed him to capture the International Landscape Photographer of the Year Award. Having firsthand knowledge of these areas from a photographer’s perspective he decided to launch Exposure Tours to share more formally what he learned and to inspire other photographers of all levels whether their interest is pursuing the craft as a business or strictly for personal enjoyment. The last three years have seen him gain awards from the City of Toronto, IPA and PDN. His work has been featured in US and European magazines and books including the Best of Photography 2012. This year he was awarded the ‘Best Magazine Editorial Image’ for his safari image. He also accepted a seat on the Board of Directors for the New York Photographers and Writers Association. 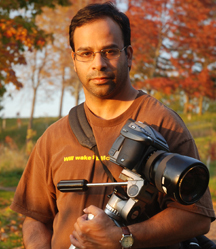 30 of his Fine Art Prints are on permanent corporate display and he is a featured photographer for pocket wizard as well as a coach for photo guru.